Perhaps, one of the most memorable Olympic quotes for Japanese is this: We can’t let him go home empty-handed. This was first said in London by an Olympic swimmer when his teammate failed to capture an individual medal. If you say you can’t go home empty-handed as an Olympic athlete, it means you’re determined to win a medal, whatever the color. Eventually the team came home with a silver medal. The line was twice quoted in Rio de Janeiro, first by the men’s swimming team again and secondly by the women’s table tennis team. We can’t let him or let the team go home empty-handed. They both won bronze medals. 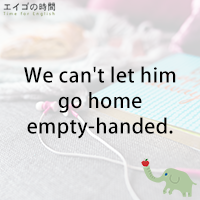 I’ll give you more example sentences using the phrase “empty-handed” on Thursday. So, make sure to come visit our website. In the meantime, be well and see you next time.